I rough cut the end miter on the head rest with jig saw, and then I flush trimmed with a clamp-down straight edge. 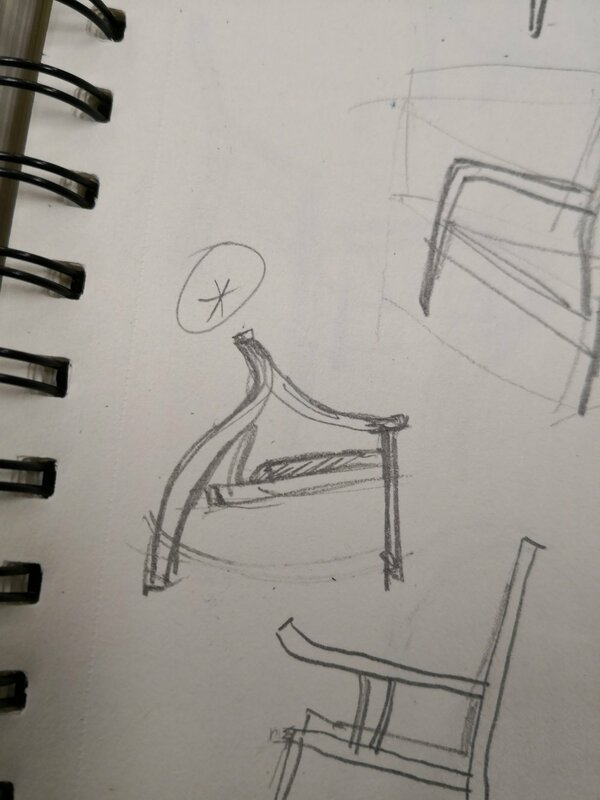 I am not able to find an exact angle on the head rest miter due to the shaping and steam bent spring-in. My plan is to make the miter on the head rest as accurate as possible and test and cut out the front legs miter joint to compensate the 90 degree relationship. In addition, the bottom rail has to land within the edge surface of the front legs, and the both front legs needed to tilt at reasonable angle. The entire process was slow and tedious, but I was able to finally figure it out. Next, I layout the joinery and cut with Felstool domino machine. I used horizontal mortiser to cut the mortise on the bottom rail. Since the rail is a curved part, I decided to drill holes at different height to accomplish the mortise vertically. 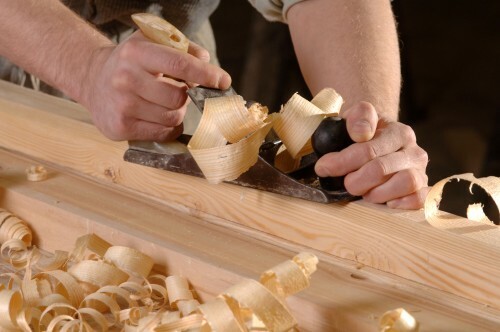 Similarly, same technique was applied on the front leg mortises; they were drilled on the drill press and chiseled smooth by hand. 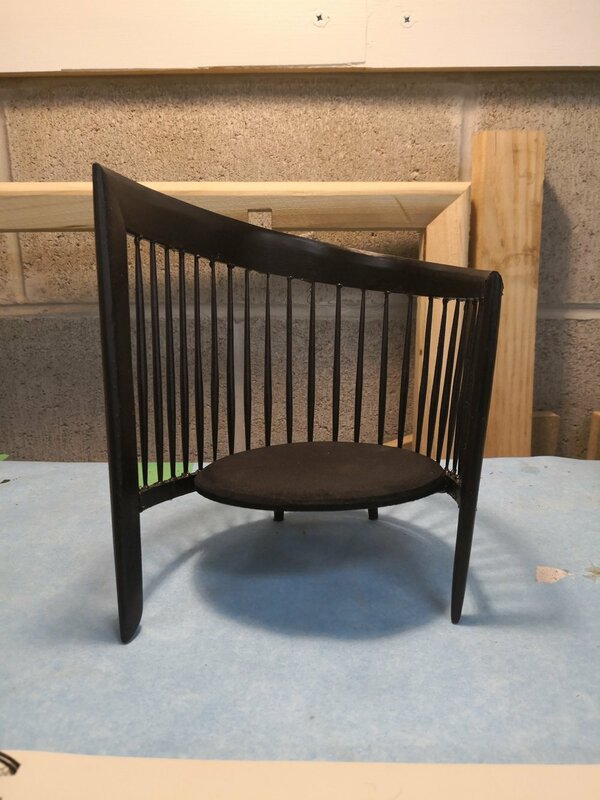 Moreover, the chair seat frame have been sent out for the upholstery, and the seat panel is glued to bottom rail to not only support the cushion, also correct the spring-in happened on the bottom rail. The back legs are glued and trapped into the seat panel in order to create a concrete solid structure to support the chair. Before I start the final glue up, I managed to cut all legs to level and hand shape many parts to rough form, because these tasks will be too difficult to once the chair is glued together. I separate the glue up into 3 stages, the first stage is to glue up back legs and bottom rail to seat panel, and the under seat rail is attached by through wedged dowels. 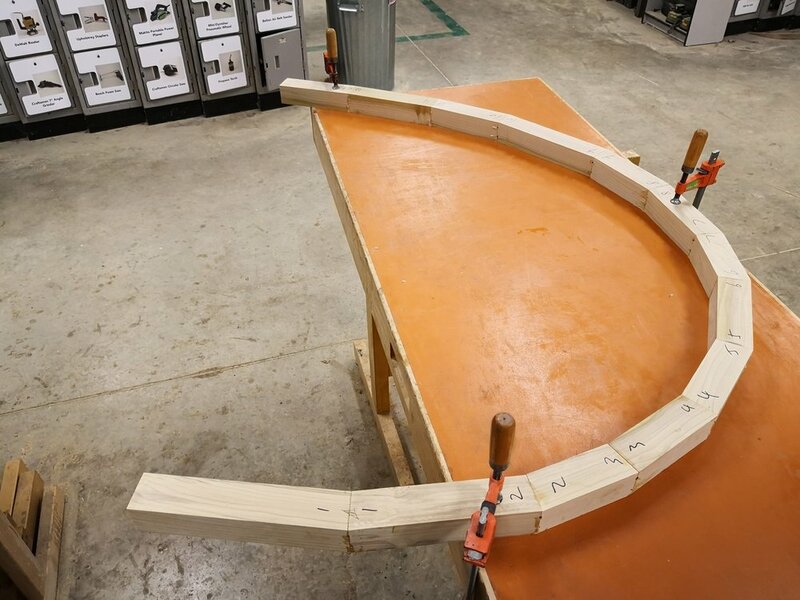 Further, the second stage is to glue all bottom of spindles with G2 epoxy to bottom rail; the third stage of the final glue up is to glue spindles to head rest with epoxy and rest of joints with Titebond at the same time. After the epoxy is dry, all spindles are locked by 1/8’’ pin as shown in image. Thanks to my classmate’s help, my final glue went well, and now is time to start final shaping, refining and sanding. Fabrication continues, as I mentioned in my last blog post I have invested ton of time into the spindle shaping. All of the spindles are first rough cut to their template shape with bandsaw, then flush trimmed to the perfect profile on router table. Next, both ends of the spindle were turned into cylinder on lathe; the body of the spindles were rough shaped on belt sander and hand shaped with spoke shave. Last, I smooth out the plane marks with orbital sander with foam disc. All of my steam bent parts are too wide to fit the thickness planer, so I used CNC router to machined all top surfaces flush. However, the end mill bit on CNC router left a lot of burned mark on the wood surfaces. Since I already had both surfaces parallel each other, I simply just jointed the burned surfaces on the regular jointer to remove all the marks. Unfortunately, spring-in happened in different degrees on all of my bent pieces. 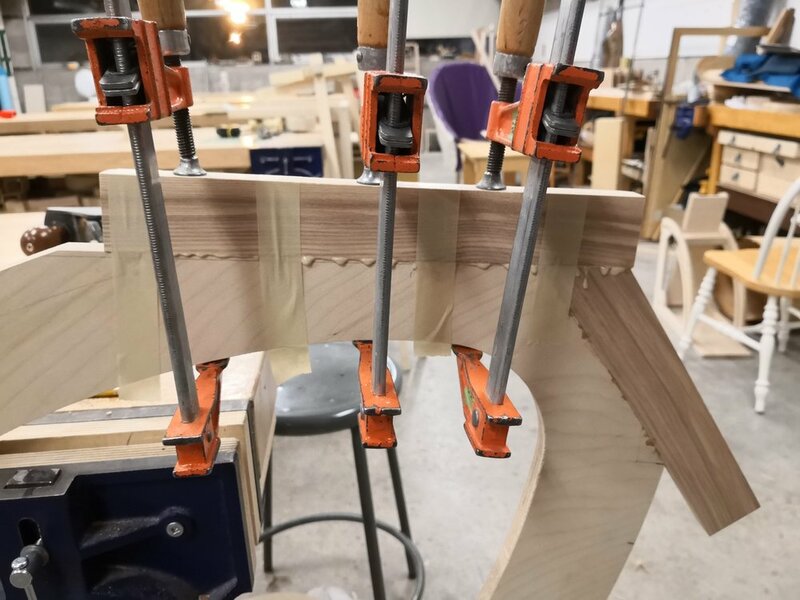 I arranged the least spring-in part for the very first layer on my head rest lamination, and in addition, the glue between the staggered lamination were also able to help reduce the spring-in on the finished head rest. The bottom rail steam bent part was oversized on the width. I was able to use template to trim the part I needed out of the rough stock. 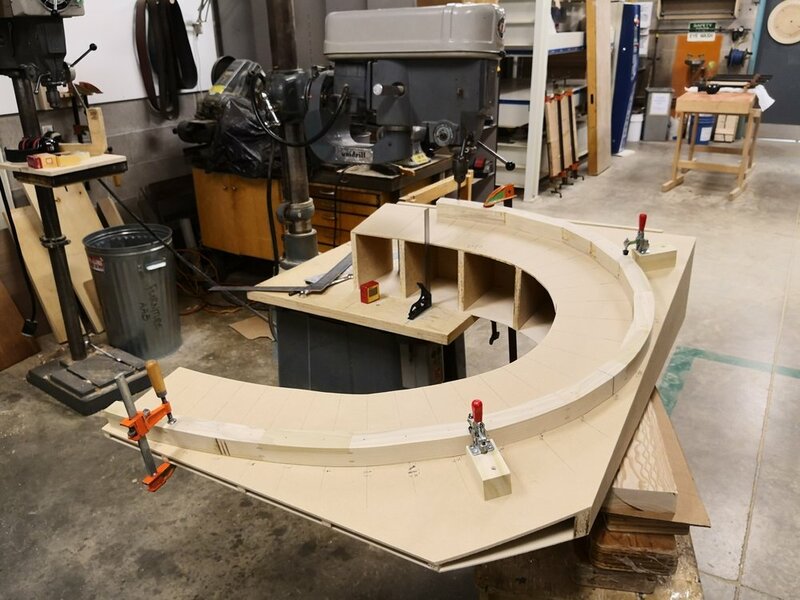 Most importantly, I created flattened joinery surfaces on the inner rail surface for the back legs and under seat rail to attach. Before I do any spindle holes drilling, I wanted to create an last opportunity to test my jig. I made a mockup head rest out of segments of poplar and drilled holes as accurate as possible. In order to restrain the spring-in, I screw two blocks on my angled jig to hold the steam bent part in position for drilling. Moreover, I clamped seat frame on the lower rail to correct the spring-in as well. Long story short, everything workout fine and I was able to start my final drilling. The following step was to cut out back legs with CNC router and start laminating the steam bent pieces. My head rest lamination required individual piece be held at ideal shape while the glue up taking place. And every part was laminated 1/4’’ offset each other which allowed me to carve a spiral shape out of it. Once the head rest lamination completed, I used an angle grinder with wood shaping blade and a portable electric planer to remove the excessive material. These tools are very helpful and efficient on shaping wood, and I was able to complete the rough shaping on my lounge chair head rest in a couple of hours. The images on the right show the process of the lamination, shaping and the result. In the meantime, I layout the cut line on the head rest, and ready for the miter cuts which connect to the front legs. My thesis project development is still slowly running towards my year goal. 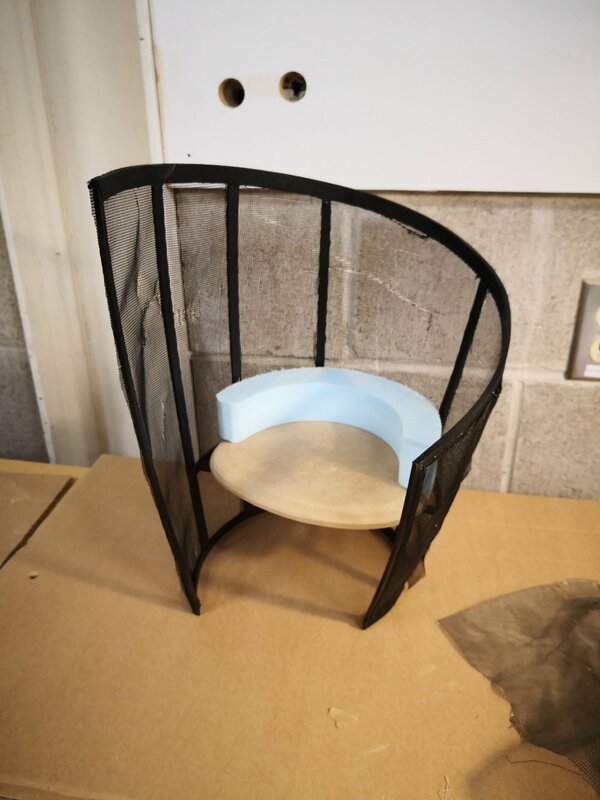 Since I have finished the steam bending, I urgently wanted to nail down my chair seat shape and the fabric selection for the chair, and at the same time I managed to further develop my side table design and made a mockup for my midterm critique. 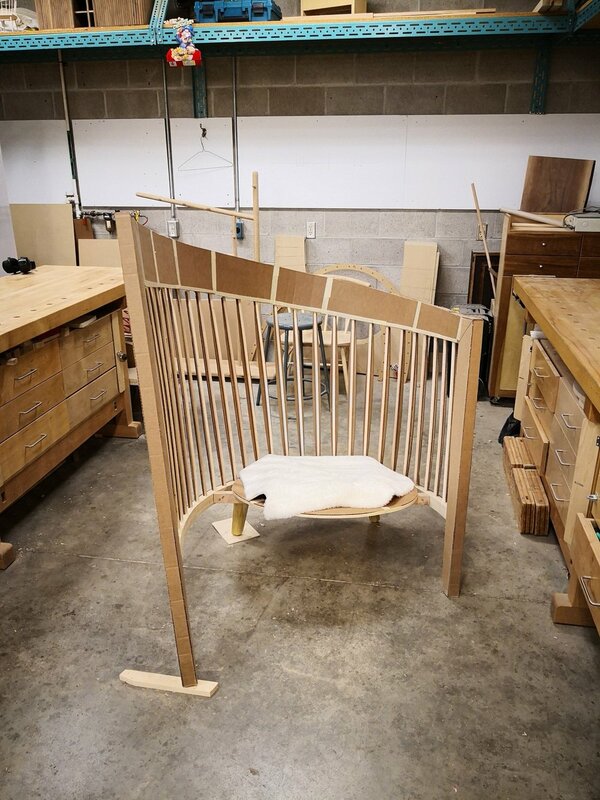 Fortunately, I have been selected for participating the 2019 WantedDesign LaunchPad in May, Manhattan, New York; according to the application I submitted, I need to try to finish the chair project before March 31st to leave myself enough time to do the photography, and allow WantedDesign to do the social media promotion. More importantly, I have to do a lot of preparations to bring the project over the boarder. 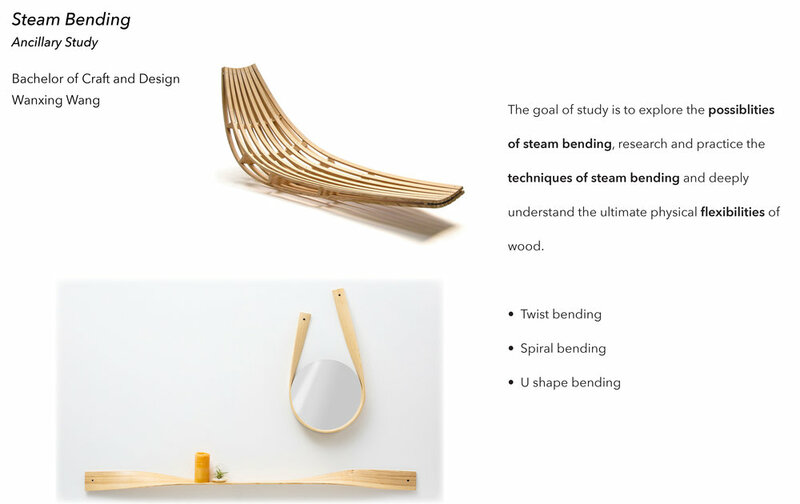 Next, I have been inactive on my process document for my thesis project, mainly because I had so many details needed to refine and revise on my chair design, I wanted to complete settle down the design before I do any changes. 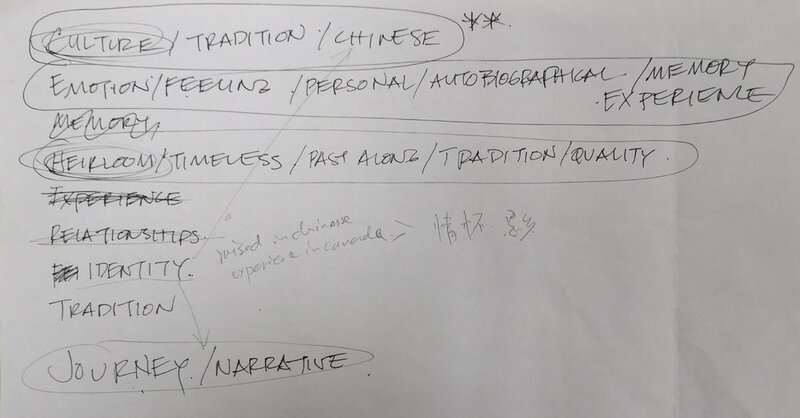 I thought it is the most efficient way to do this kind of document, which helps me to focus on the content not the unfinished tasks. 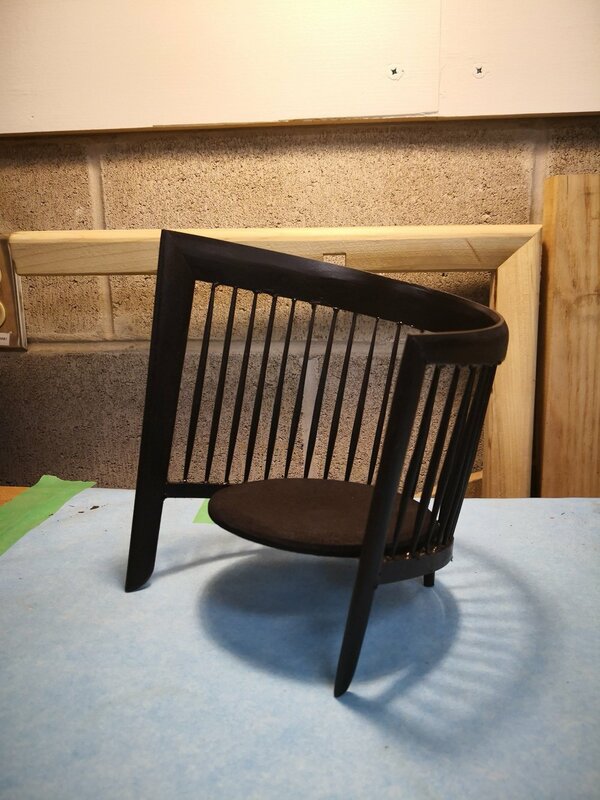 Based on the feedbacks I recieved on the midterm critique and some thoughts from faculty members outside of the program, I have done various changes on the chair seat structure, shape and upholstery. I think now it is about the time to start working on the process document. Currently, I have start my fabrication on the chair and still polishing the side table design. I have so much emerged into my own design and never really considered the seat upholstery carefully. I have decided to ask some of our faculty member outside the program, and I was trying to get feedbacks which may help me figure out the best fabric and more balanced color for the chair seat. 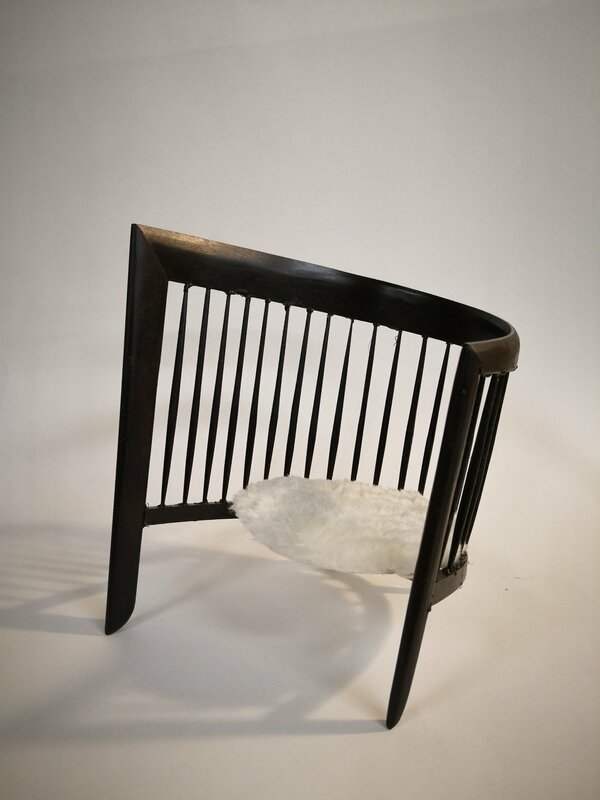 My original idea was to use natural material such as wool or felt to mimic the paper texture, which is to create a thematic connection to the calligraphy inspired chair gesture. I have taken the advise from faculty member, went various of fabric store in Toronto. The felt samples image you see on the left is from the King textile. These samples are made of 100% wool, they feel very soft. However, my thesis instructor suggest me to look for more high-end well made woven fabric, because the natural wool may just let the people feel too cheap for my chair design. I agree, the chair should look holistically connected. Moreover, I personally feel there are should be a visual connection between the seat and the chair frame. 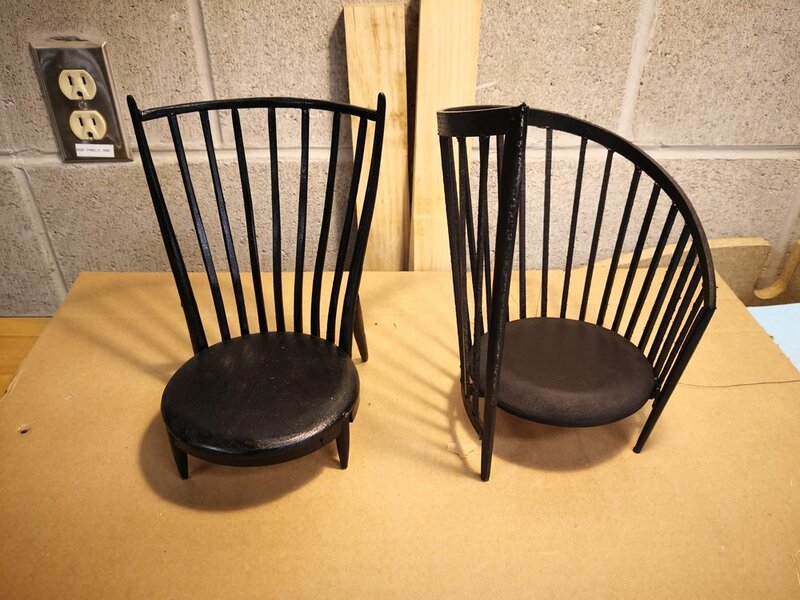 As you can see in the rendered picture, the light grey seat is visually separated from the black chair frame. The other two fabrics in the images come from Maharam. I visited the Maharam in Toronto, and went through all of their fabric catalog and selected two of my favorite wool woven fabric. They both felt very comfortable, and their woven craftsmanship on the fabrics are excellent. Based on what I mentioned earlier, I selected the Hallingdal by Kvadrat 460760–173 as my seat upholstery fabric, because it contains black and grey, which helps the seat blend into the chair structure. I have placed the fabric order last week, and now have been delivered. 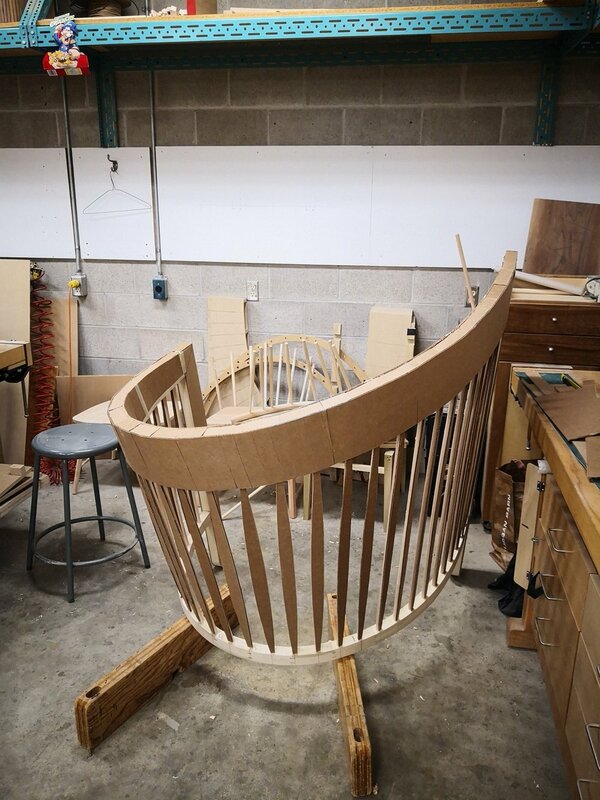 Additionally, as you can see in the last image above, I would like to construct a panel under the seat cushion, not only to create a visual link to the seat but also help to secure the structure. 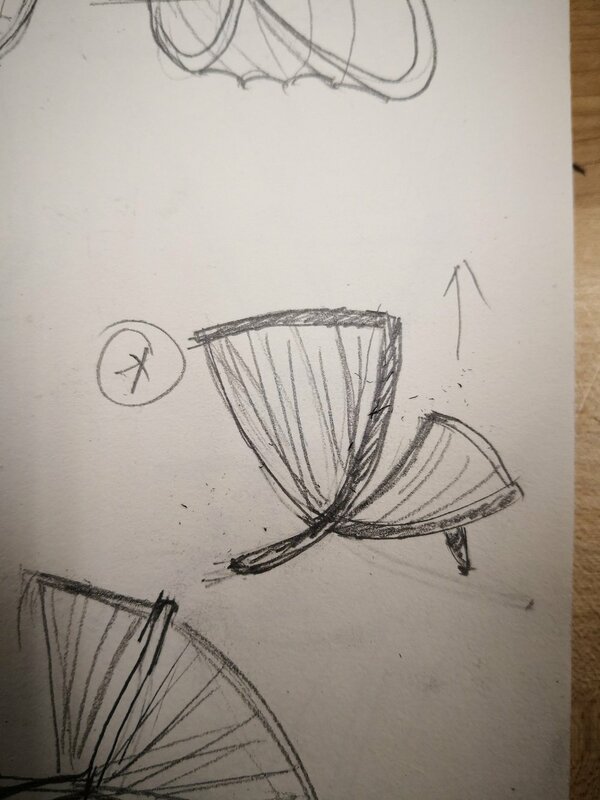 The reflection I got from the midterm critique mostly is about the seat shape. Both instructors and the guest are suggesting an asymmetric seat shape to match up the chair form. In the past weekend, I have done some changes on the digital model and cut out a physical template; during the break week I am going to make a cushion mockup to test out the depth of the seat and the comfortability of the seat. Inspired by lili pad and lotus, I designed this side table with a water ripple effect on the surface, which brings the quietness and poetic beauty to the design. 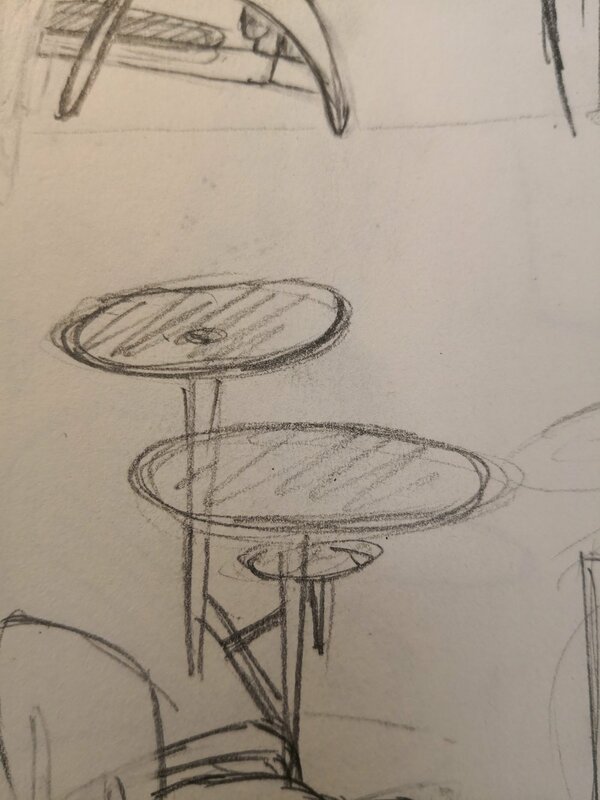 To come up with this idea, I have re-drawn many sketches to figure out the composition on the three surfaces table. 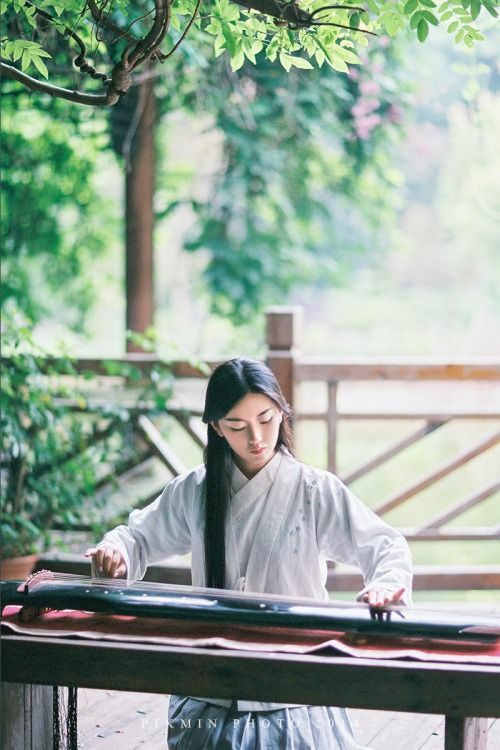 In my theme of serenity, I am not only enjoy the psychological serenity happens in the calligraphy, also the serenity formed by the natural environment. Through my model making process, I found the three surfaces for a side table is too busy and redundant, and I was not able to test out a perfect composition for it. Thus, I simply reduced it to two surfaces, which further emphasis the ripple effect detail. 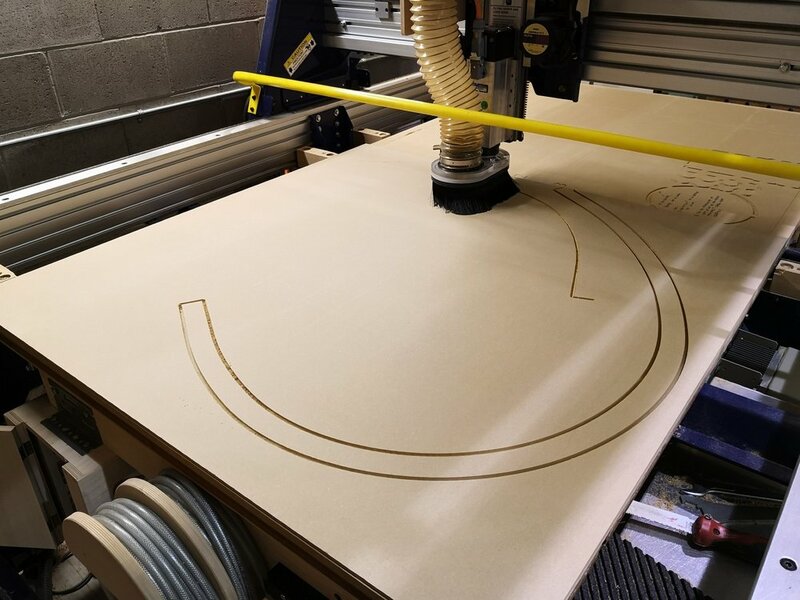 I cut table top in many different sizes on CNC router to find out the perfect dimension to match the ripple effect detail. The final mockup I presented in the midterm critique has 21’’ diameter for the large table and 11’’ diameter for the small surface. My feedback on the table was to increase the height of the small table, therefore to give more space and attention to the ripple detail. 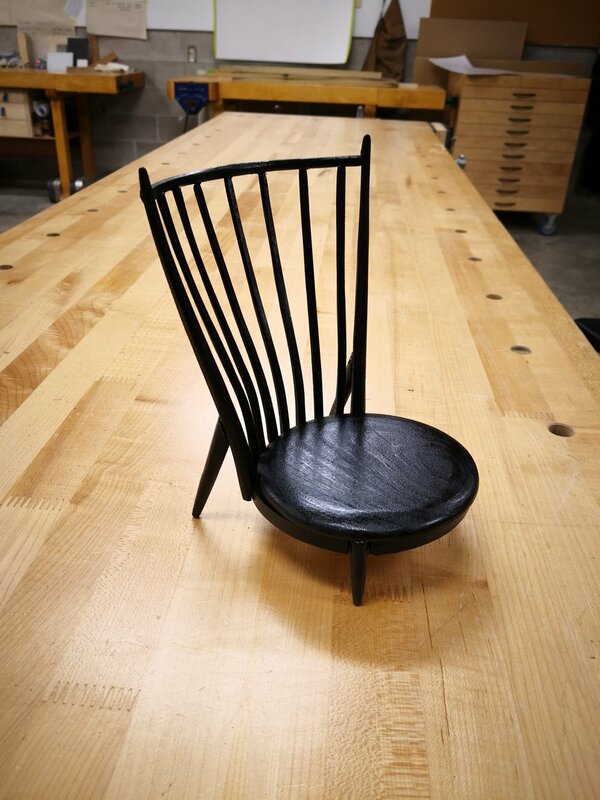 In the past weeks, I have also accomplished many preparation tasks for my chair fabrication. 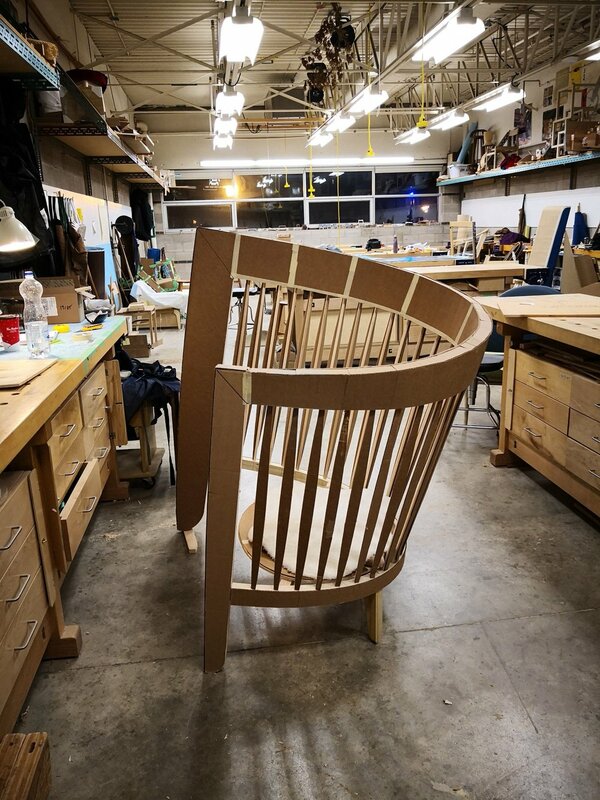 In the first image, you can see a torsion box supporting my chair mockup; it is to secure the chair for assembly and shaping. It also helps to installing the back legs and trimming the legs to a same level. 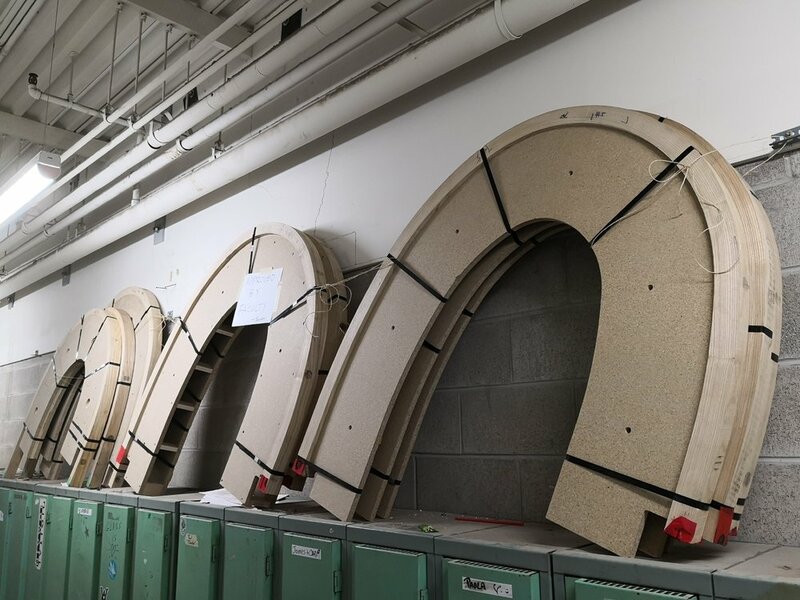 The CNC machine is very useful for my fabrication; I cut all the spindle templates with the CNC router, because all of my chair spindle have different length and width. 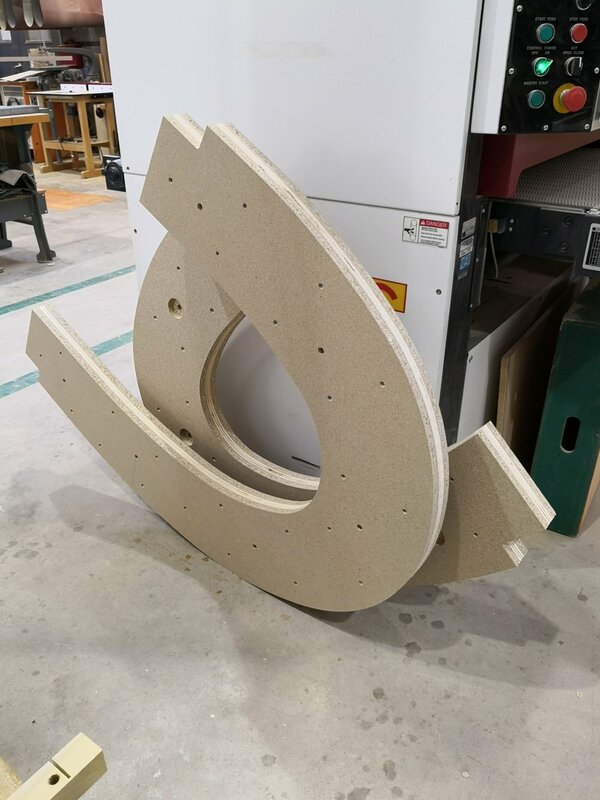 Furthermore, CNC machine could accurately engrave reference lines on the sheet material which is used for the angled drilling on the steam bent chair head rest. In the meantime, I have removed some of the steam bent stocks from the drying form, and jointed the bottom surfaces to same level. while I am waiting other steam bent piece to dry, I started milling some material and fabricating spindles. Here are some video clips on my fabrication in the Instagram links below. In the past few weeks, I have tried to push myself to get my steam bending finished as soon as possible. 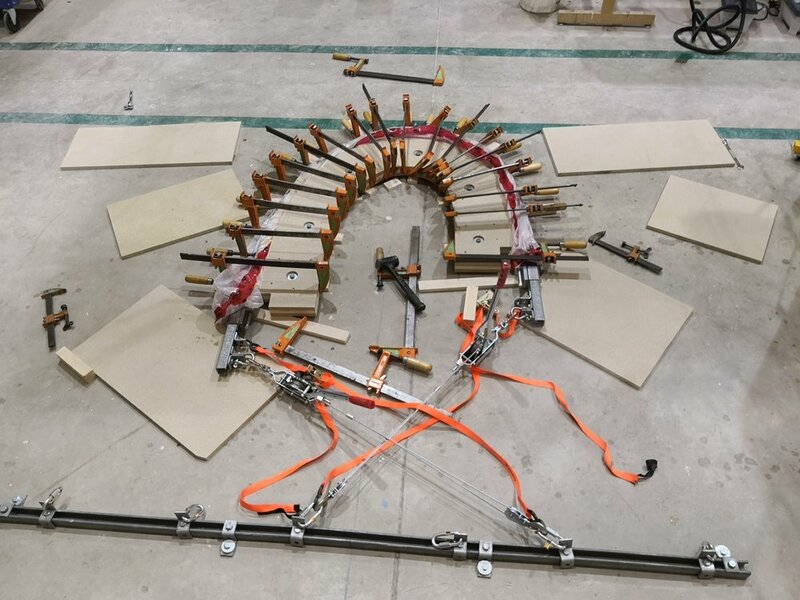 By end of this week, I have finally finished all my steam bending tasks, in total of 8 pieces were bent, and all are now left to dry for 2-3 weeks. 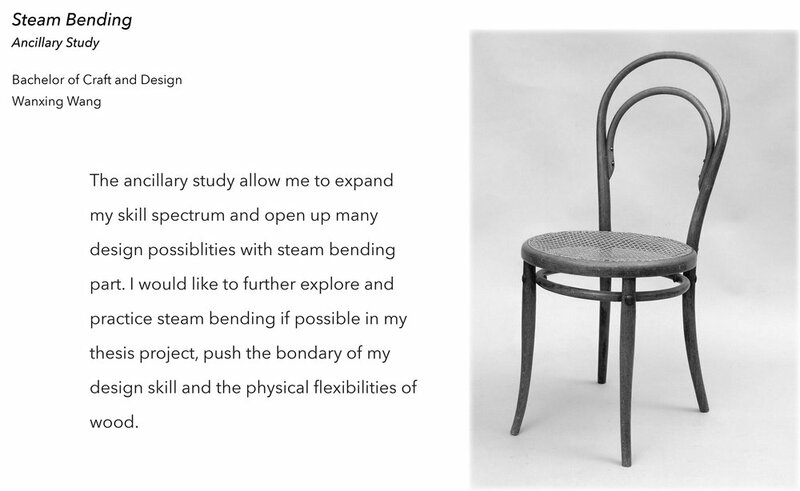 My thesis chair’s head rest and bottom rail both are made of steam bent parts. As I mentioned in my previous blog post, I have gathered some air dried material for my steam bending during the New Year break. 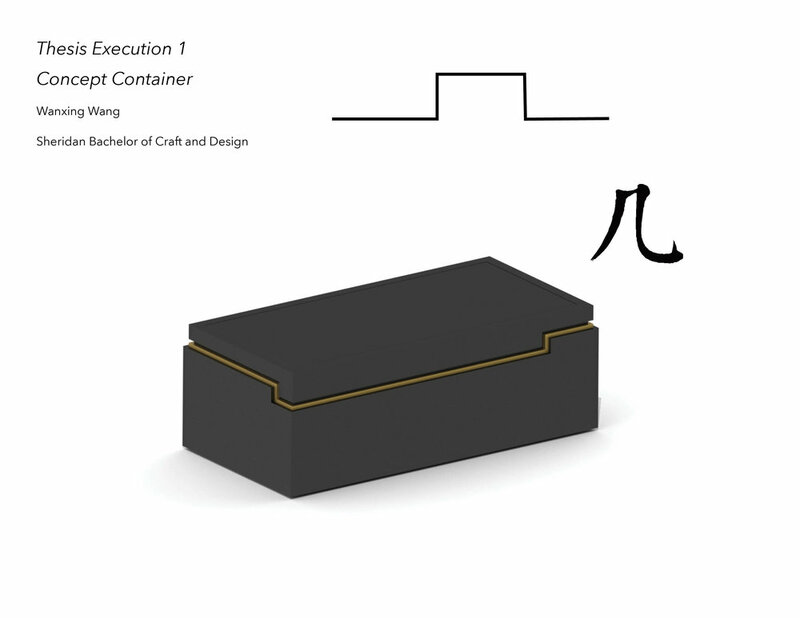 Additionally, according to my digital drawing, I needed to fabricate a brand new steam box to fit 9 feet long stocks. I used water proofed plywood create multiple double layer steam boxes, and they are interconnectable and interchangeable to fit different length (The kit is also made for the studio). In the images on the left, you can see the boxes construction and steam in progress. The second challenge was to figure out how to bend a piece at 9 feet in length. 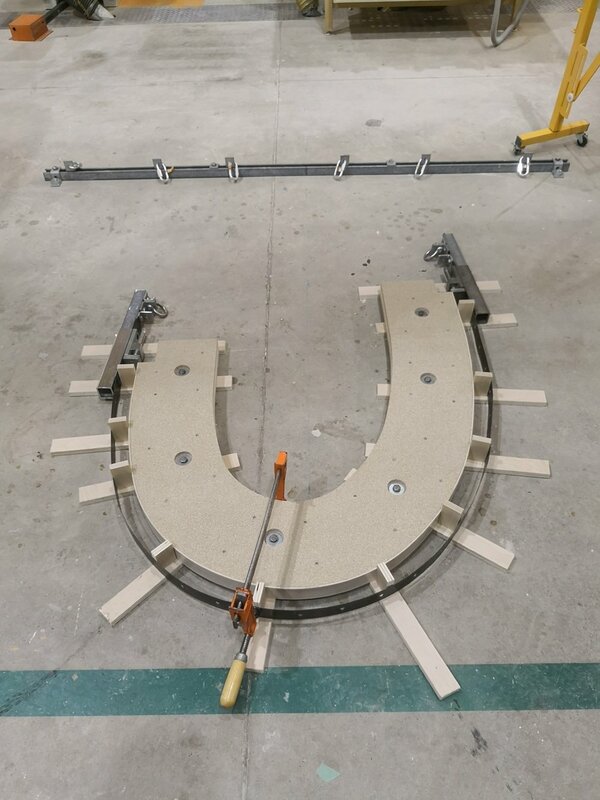 It was almost impossible to create leverage and bend it from a single end, because it will take too much space to swing a full circle in 20 feet radius. I received consultation from faculty member who was saying that I should bolt the form on the floor and bend it by using come-a-long puller. 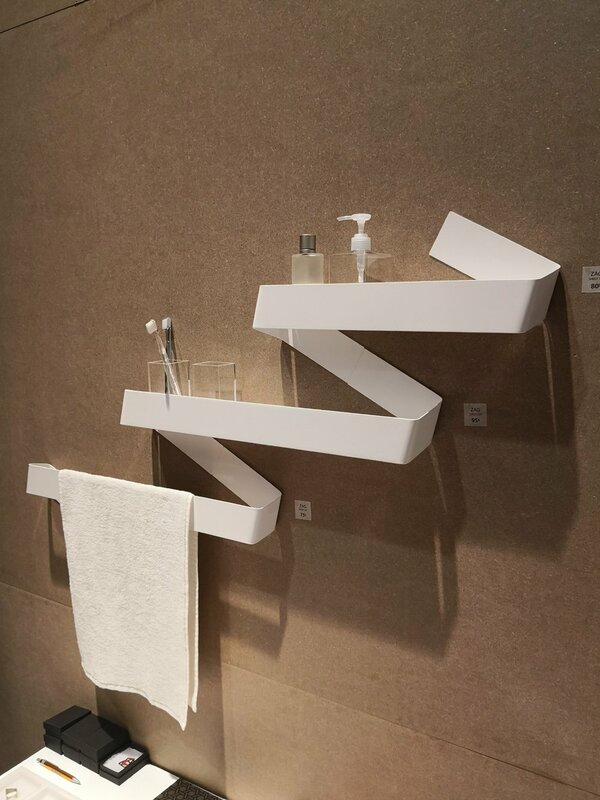 This idea significantly reduced the space and physicality of the steam bending. 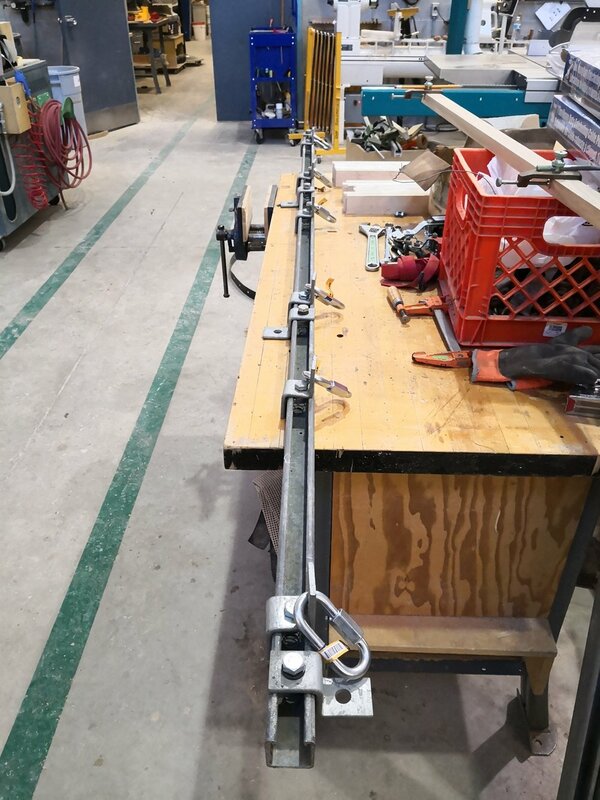 I was able to bolted a metal bar that has many brackets attached to on the floor, which used for changing the direction of the pull on bending tool. Moreover, I extended the bending tool with additional metal bar and attached one shackle at each end for the puller to hook onto. Next, I created the digital files and cut bending forms and drying forms on the CNC router. 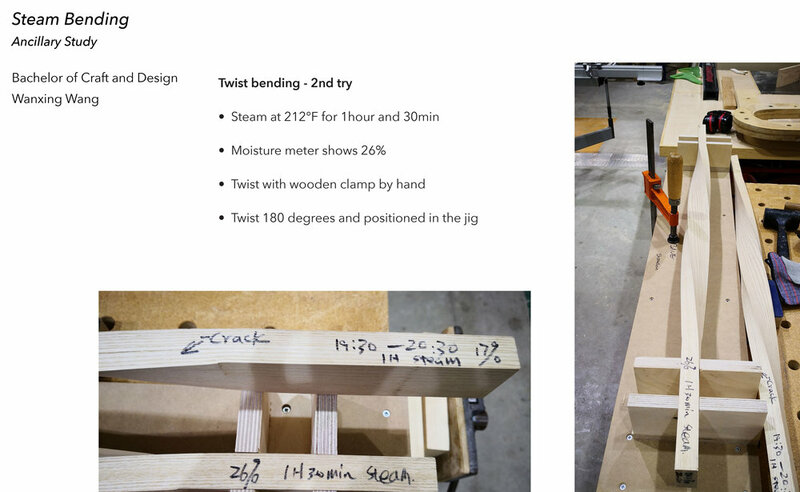 As you can see in the images on the right, I laminated one layer of plywood in the middle of the bending form to increase strength of the lamination. 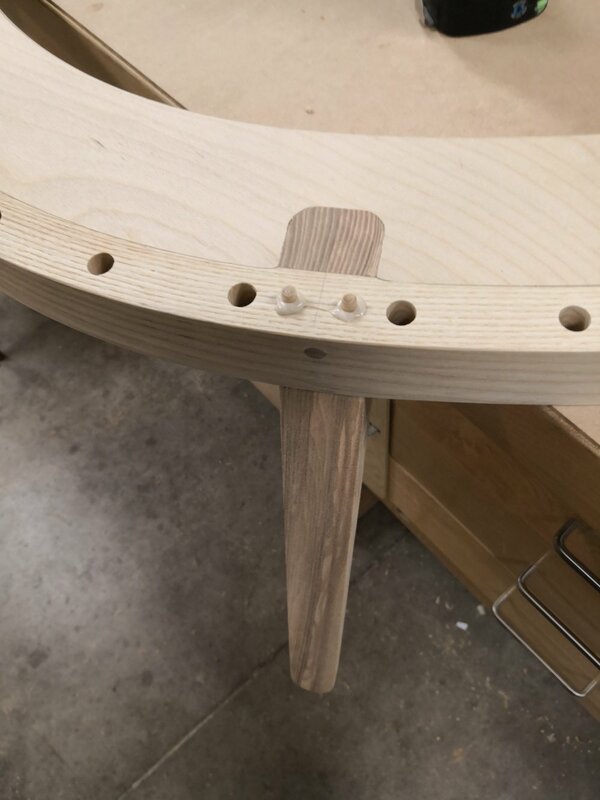 Then I added spacers under the form and elevate the form to create the alignment between the center of the form and the hook point, which is to ensure the pulling force is in the center of the stock while steam bending. More importantly, the key for steam bending is to control the heat. It is difficult to maintain the temperature on 2’’ X 2’’ X 9’ stock once it is being taken out of the steam box. To slow the process of losing heat and extend the time window for steam bending, I put the stock into a plastic bag, and hook the steam into the bag to keep temperature up. 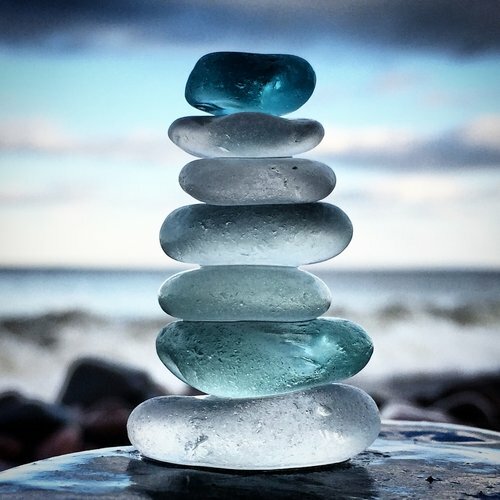 This technique has made the process more relax. In the video I linked below, you can see the entire 25 minutes process of bending in time lapse. Finally, I managed to finish all 8 pieces in a week; I transferred them to drying forms and secured them with metal straps. White ash 9 feet long 2’’ by 2’’ stock steam bending process time lapse. It was very interesting to see all different kinds of design in IDS and design offsite this year. 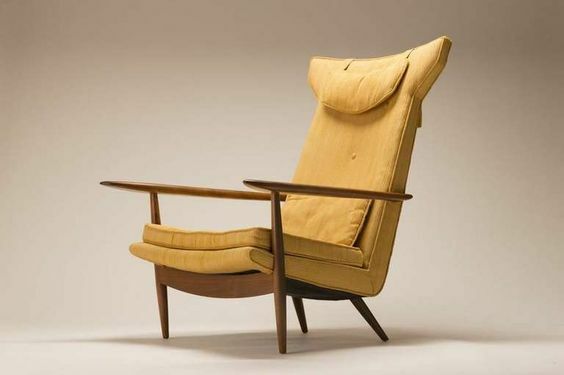 There is a Canadian trend forming up through some post-modernism influenced or inspired design. 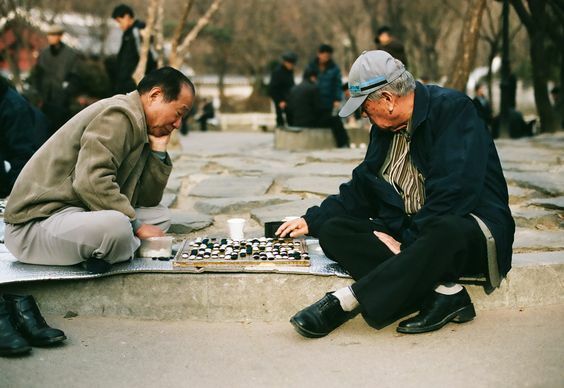 I personally enjoy to see the playfulness and creativity embedded within the projects. However, I felt a little bit of odd and overwhelmed to experience so much colorful designs in a such short period of time. I start getting some color-seeing fatigue…. In addition, a lot of products are excellent and many new student concepts could be pushed to be better prototypes. At the same time, I think many designs have not been well executed, and their functionality are questionable. 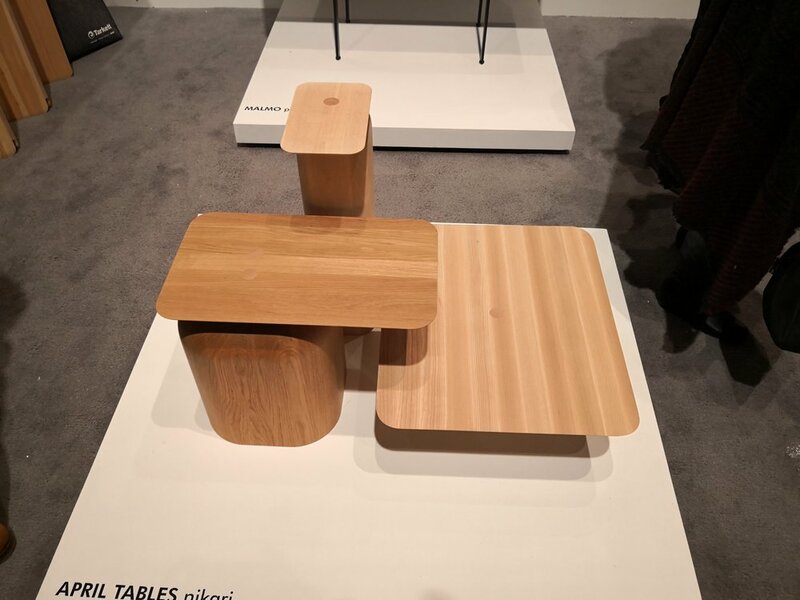 April Tables by Nikari was my favorite design at IDS this year. This table incorporates visually light planar surfaces with visually heavy and bulky forms in the space to create very balanced design composition. Although there are no same shape and form are identical, the visual circulation on this piece is so strong. I really enjoy seeing three different heights and sizes of table surface working together with different heights and forms of table bases. 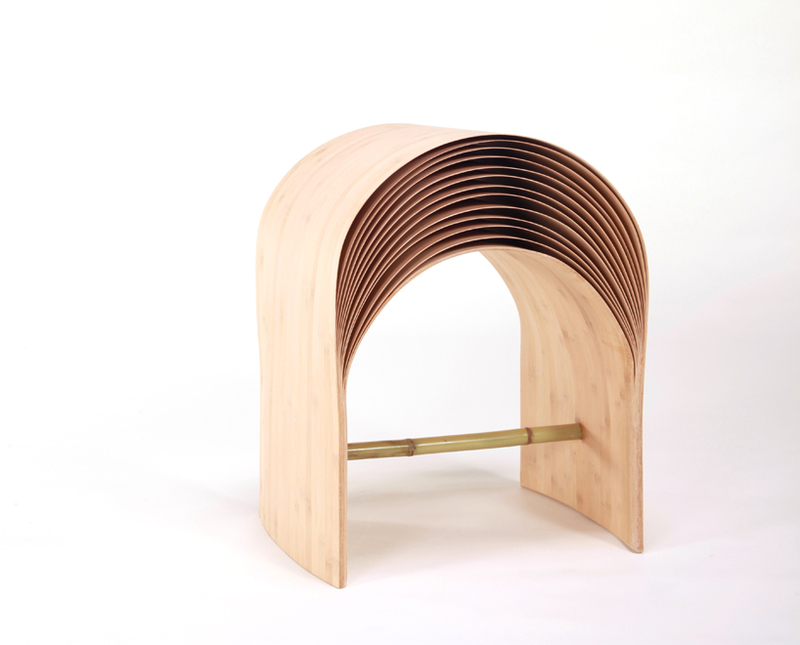 It is a very inspirational to my thesis side table design. The lighting piece OHM by Anony is also very attractive. 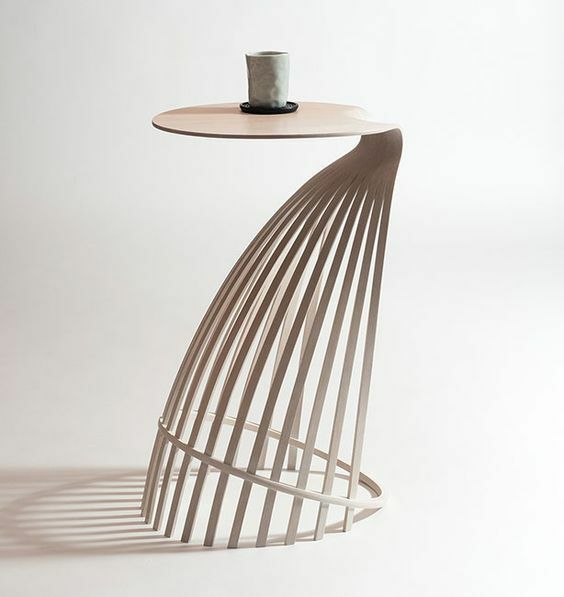 Compare this light to the side table by Nikari, I think they have one thing in common, which is the excellent design execution on their composition. 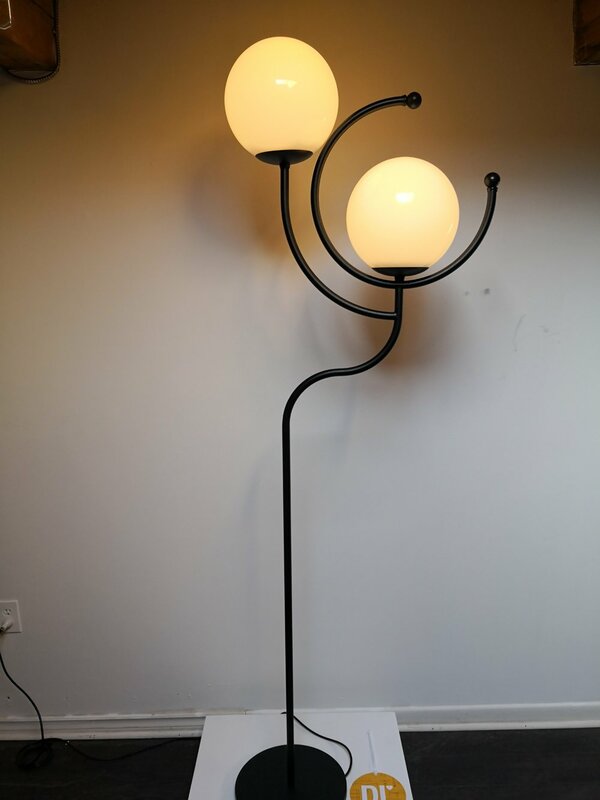 The direction and height change on the light is thoughtful and pleasing, and the continuity is formed by the composition and the individual detailed cutout on the light. Moreover, I believe the ratio between the covered surface and the exposed light bulb surface are carefully considered as well. 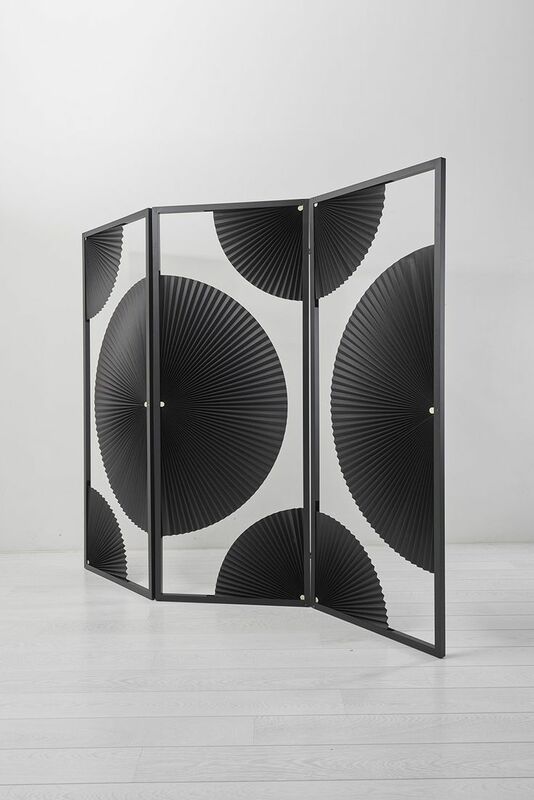 Another interesting design at IDS was the high back chair by two by four design. 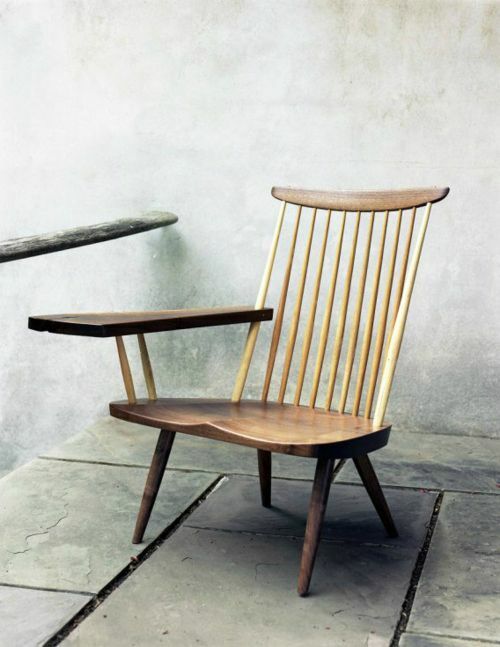 The chair has both Scandinavian and post modernism influences on its form; the bold shapes and organic form really make the design feel approachable and eye pleasing. 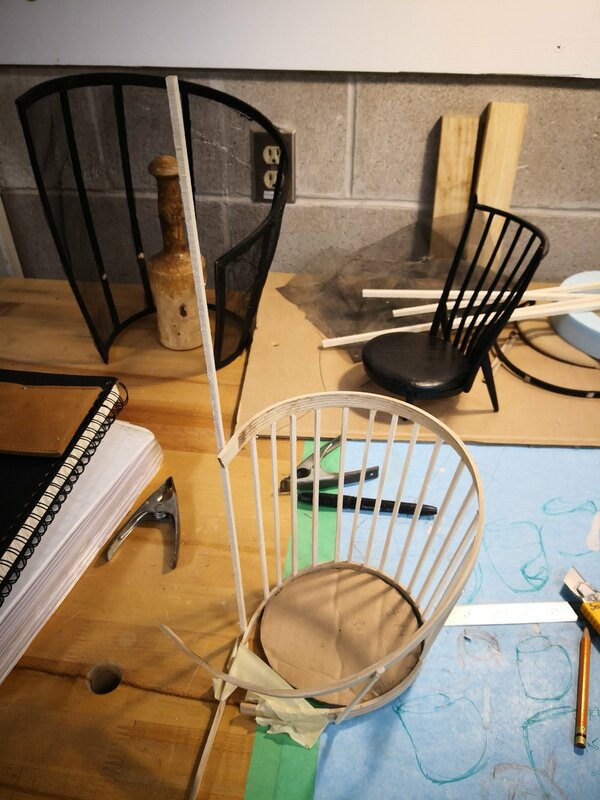 During my thesis chair design iteration, I wanted my chair to be wrapped around by the cane as well, I felt the cane would create the private and coziness feeling to the user. However, I was not able to resolve the structure behind the cane to make the design wholistic. I think this high back chair is eye opener for me to reference in my future design career. Last not the least, the chair by Div 2 has a very unique color selection, but I am really not a fan of their design. There are many designs I have seen this year have post-modernism look. They come with very bold color and form, the Bookshelf by MPGMB has very well considered design composition, and it is comfortable to look at. 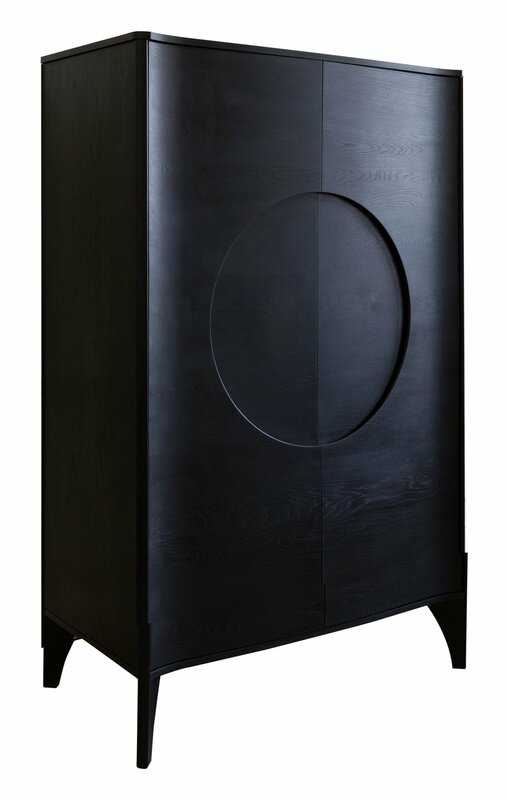 I am not trying to criticize the Post-modernism style furniture, but I feel many of the great concepts have not been well executed. For instance, the Candy-pop table has very interesting legs, but the table top is lack of balance to the entire composition. The dancers lamp has very playful gesture, but the left light bulb is too close to the metal structure, which bothers me a lot. 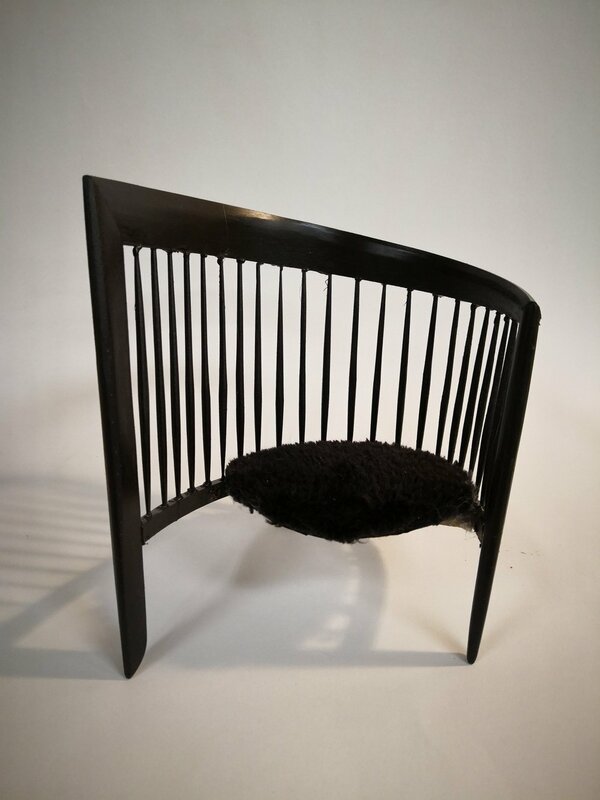 The Roque chair raised my biggest concern to Canadian furniture design, COFO design is currently red hot on social media, they are trying to push the manufacture of their design further; the main product they are advertising is this not comfortable chair. I believe the very nucleus of the seating design is to create ergonomic comfort, but the Roque chair back is very much against to this central theme, it is lack of consideration of ergonomic. Interestingly, I really like the Italian melton wool cloth used Roque chair, it has the texture I want for my thesis chair upholstery. Here are some Interesting Concept I found during the design week. This is my last term study at Sheridan College, I hope I can achieve some special tasks in these coming 4 months. Consider making the proportion of the chair seat a bit larger, because user will most likely want to curl up in the chair and/or sit in the chair in a couple different positions. 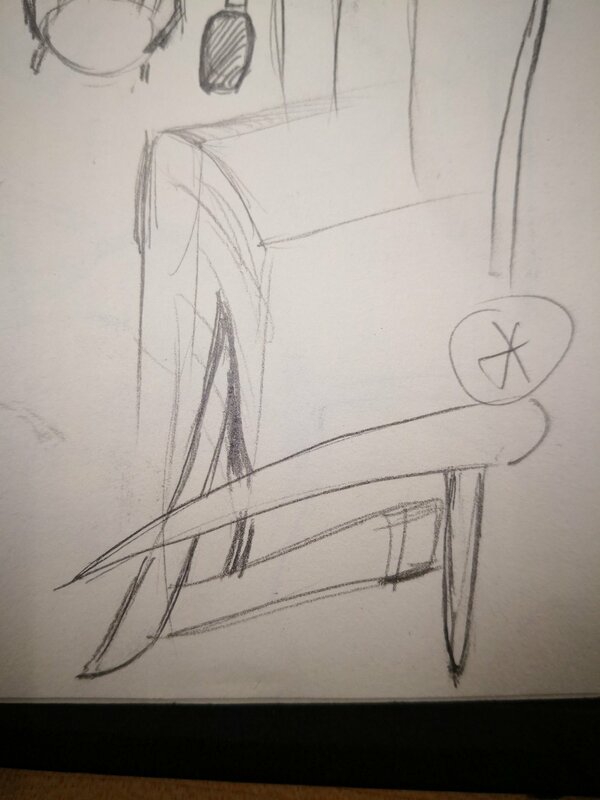 I also realize that the edge of the seat was hitting the back of my knee, and the shape of the seat should follow the dynamic form of the chair. Consider how large the arm is at the top corner, to keep the entire design look poetic and light. 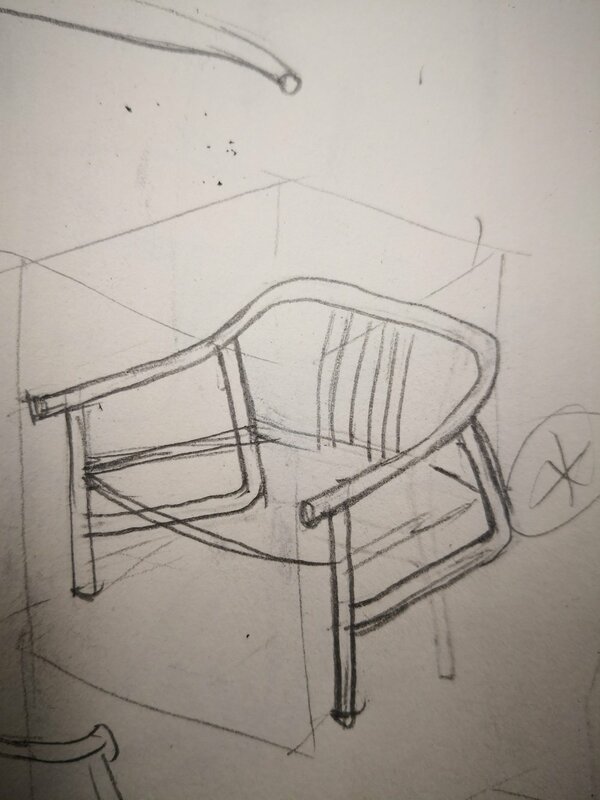 Consider the weight balance of the chair, and adjust back leg location, kick back angle and seat angle, the mock up chair was a little bit tippy. Consider the under structure of the seat, try to hide the structure as much as possible, but keep the supporting strength at the same time. There are still many details I need to retest on. 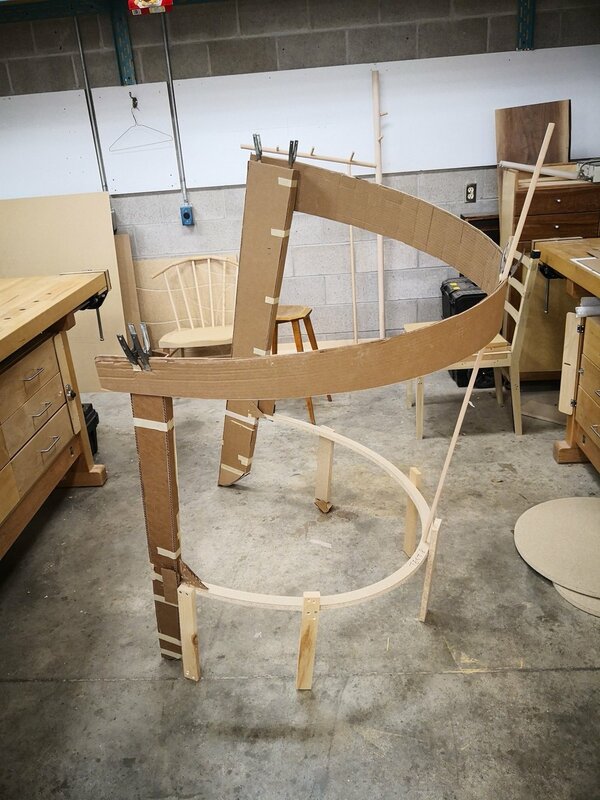 My cardboard mock up chair spindles were under some stress when I was installing them, I have went through the troubleshooting in my mind, and concluded some of details may affect its misalignment. During my mock up fabrication, I found out that the drill press was not perfectly leveled which I need to fix before going for my second mock up test. And I knew my jig was not accurately fabricated, and my parts were not perfectly aligned and positioned while I was drilling spindle holes. In addition, the drill bit was drifting during the angled drill, which may cause spindle holes at wrong angle; to fix this, I have bought the new set of brad point drill bit, and I will drill at higher RPM on my second mockup. Hopefully, these actions could help a little bit. I am planing to research into some of the fabric company, find out the fabric and foam I would like to use for the seat upholstery. More importantly, over the break, I have managed to get the air dry material I need for the steam bending. In the meantime, I need to figure out the method to do my actually 9 feet long ash stock steam bending. It will require a lot of force to do. One of the faculty member has suggested to do the bend on the concrete floor, use ratchet power puller to bend the ash piece from both ends. I think it is a feasible plan, and I need to do the preparation as soon as possible, because the wood needs 3 weeks to dry. 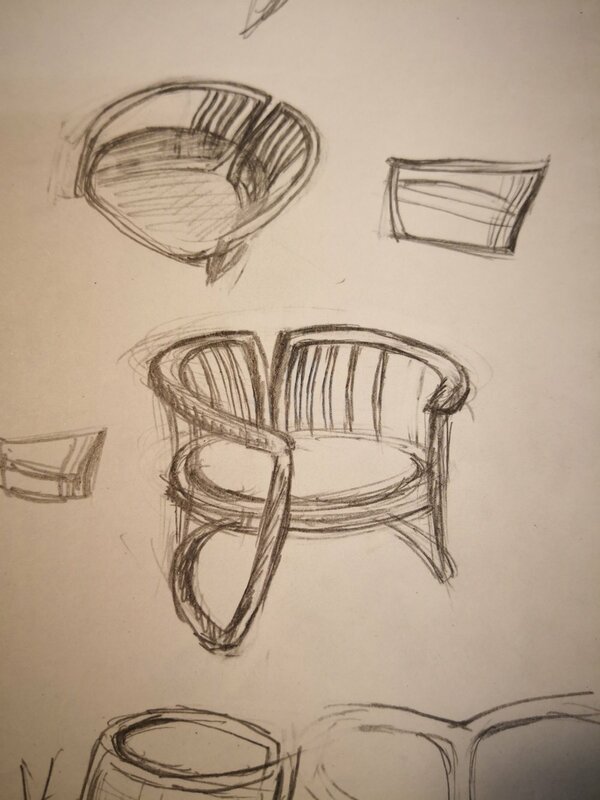 Finally, I need to start thinking about my side table design while finalizing details on the chair. 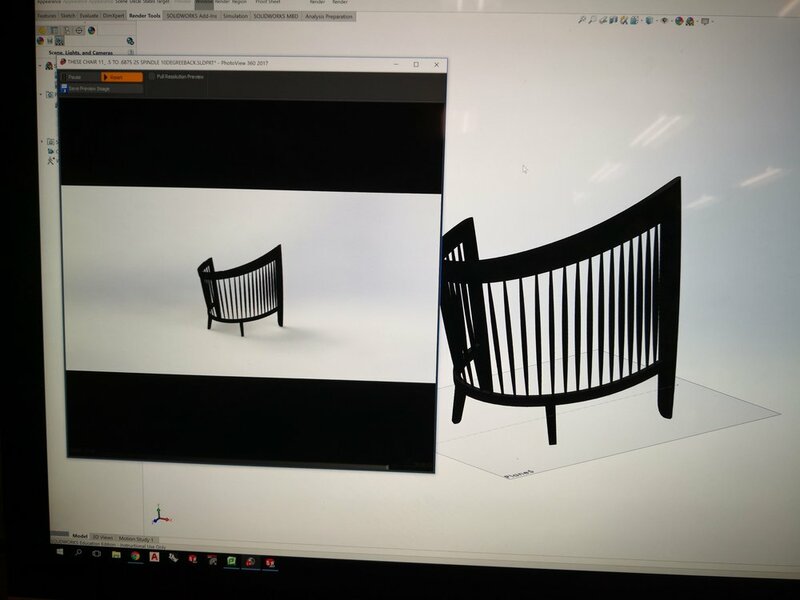 Here are some images documented the process of my first mockup fabrication, and some images of rendered image of the chair design. I have been very busy since the reading week. 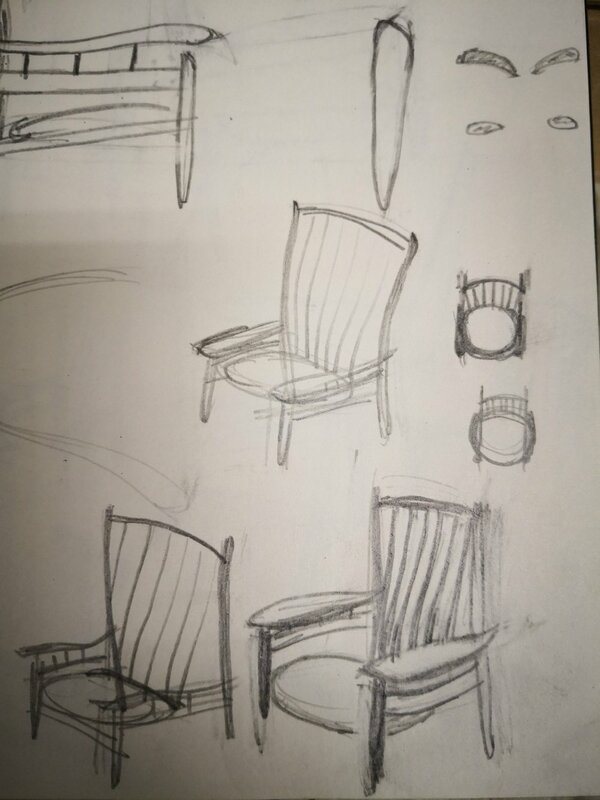 During the break, I did a lot of idea brainstorming and tried to come out interesting chair designs which not only fit my thesis theme, also aesthetic pleasing. I really enjoying the process of thinking through making; my design kept developing throughout my model making. Some of my early sketches came to real physical form, some of them did not. Images below show the process and the result of first batch of model. I was not satisfied with the first batch of model I have made. Their forms are too literal, and lack of innovation. 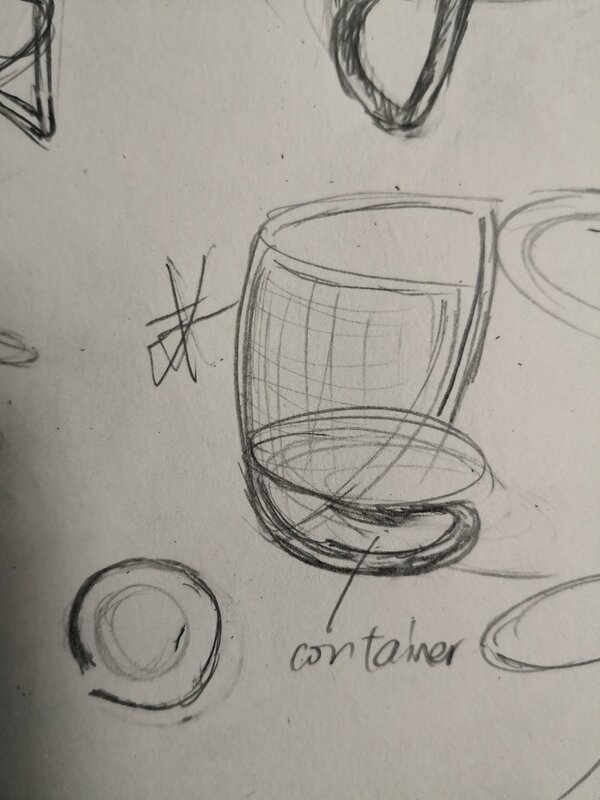 I spent many days experimenting and thinking about different types of forms; I have been also doing many ideation sketches based on existing designs after I went back home. 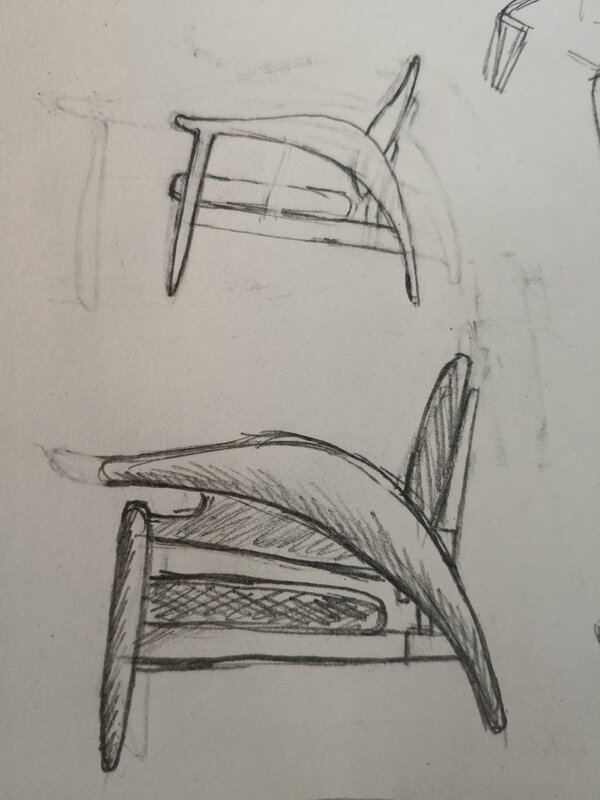 So I picked one of my initial design (design A) and put into further development by combining some inspiration from George Nakashima chairs. 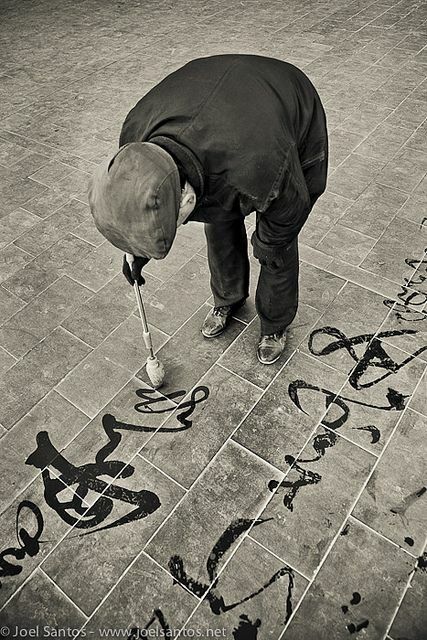 My development kept some of iconic calligraphic form from his design and blend with my own interpretation of calligraphy and contemporary culture. 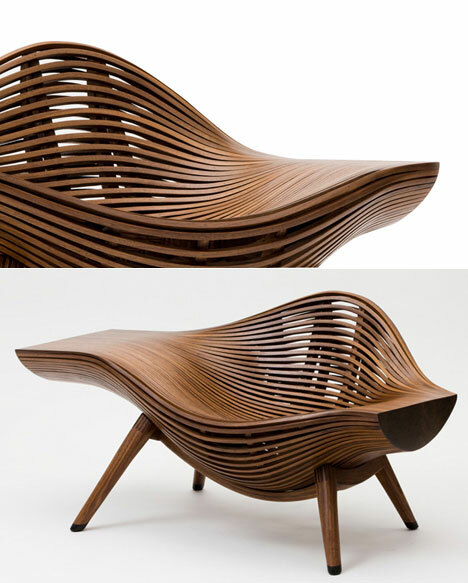 Images 1-3 below show the original Nakashima chair designs. 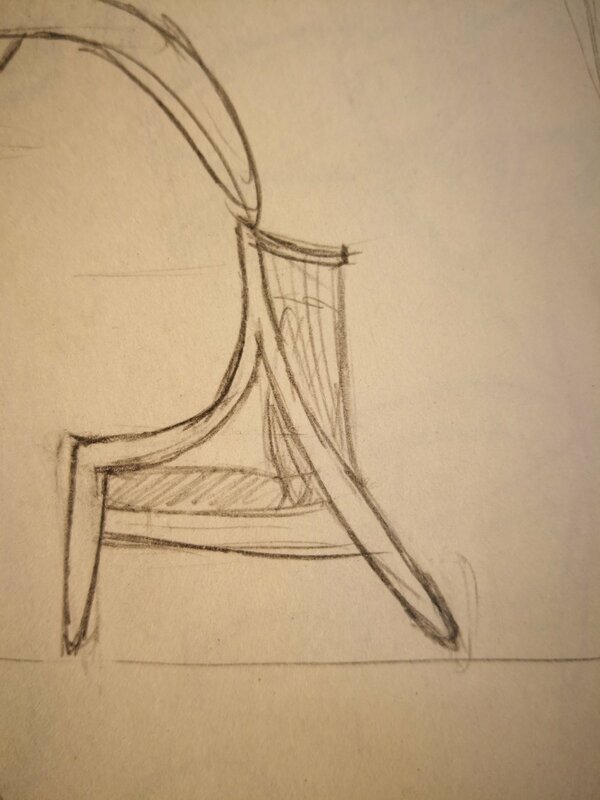 Images 4-7 below show the process of my development on this chair design. Although I really like this chair, it does not present the way I want to present my thesis them: serenity and serene movement. I decided to keep going and picked another initial design in to round two development. My original idea about design B is to use pre-made cane material to create a sense of enclosure and serenity while sitting in the chair. However, through my model making, I found out that I have to create frame works to be able to hold cane in place, which makes the design loses its purity on semi-transparency. 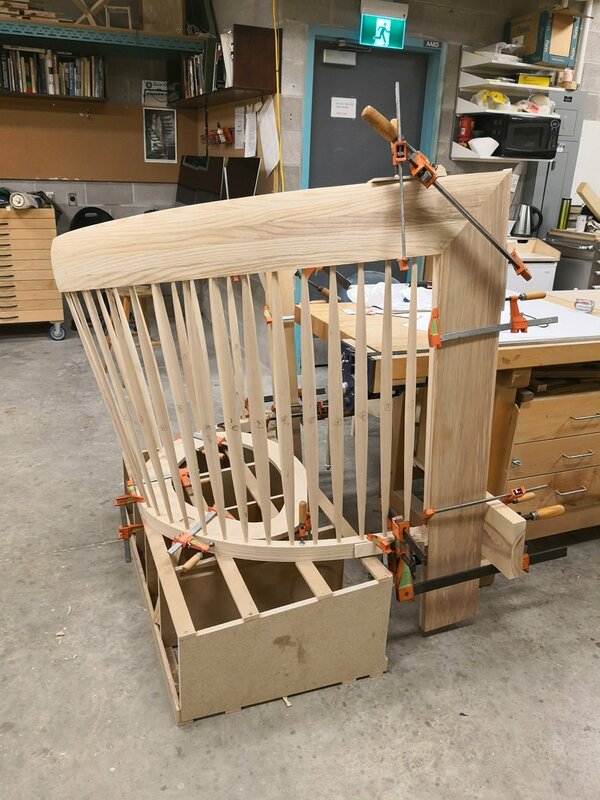 In addition, I tossed the idea of making rocking chair, because its spiral head rest will create unbalanced center gravity; so the rocking mechanism will make the chair tippy. 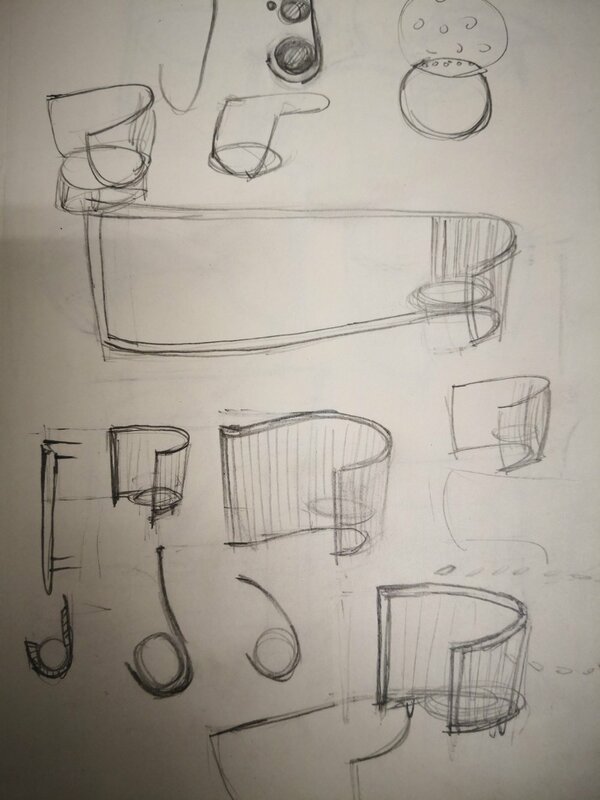 During my design development, I was drawn to a cutlery set inspired by Chinese calligraphy; its organic form and softy flow really inspired me. Later, I spent many hours on my sketch book, draw inspiration from George Nakashima and organic form, at the same time consider what can I find from the real calligraphy writing process. More importantly, I needed to keep in mind what I want to present is a sense of serenity and movement. In result of hours of brainstorming, a evolution on my design B was born. The entire process of thinking through making was very intensive and very challenging but very interesting and satisfying. Images below show my inspiration, sketches and thinking process. In week 8, I received a critique from both of thesis instructors. They both agree that design B presents my thesis theme perfectly. I agree too. 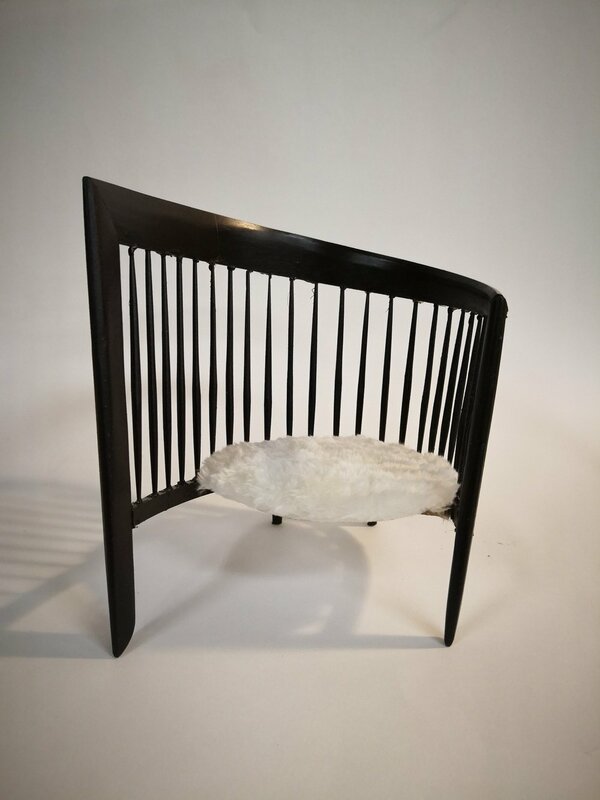 In the same week, I consulted with one of our studio faculty member, he suggested to use goat skin as my chair seat upholstery to present the warmth of the chair and also use the texture of the fur mimics the texture of rice paper which ties to calligraphy. I have tried this idea on my model; but the result is not very satisfying to me, so I am still holding on this idea at this moment. Images below show my experiment with goat skin upholstery. Break time for me!!! My head was about to blow up. In week 10 I have also received some suggestions from outside of studio about my thesis design. One of the advices was about leaving tool marks on the surface of wooden structure to relate the commonality of both the process of woodworking and the process of calligraphy writing. 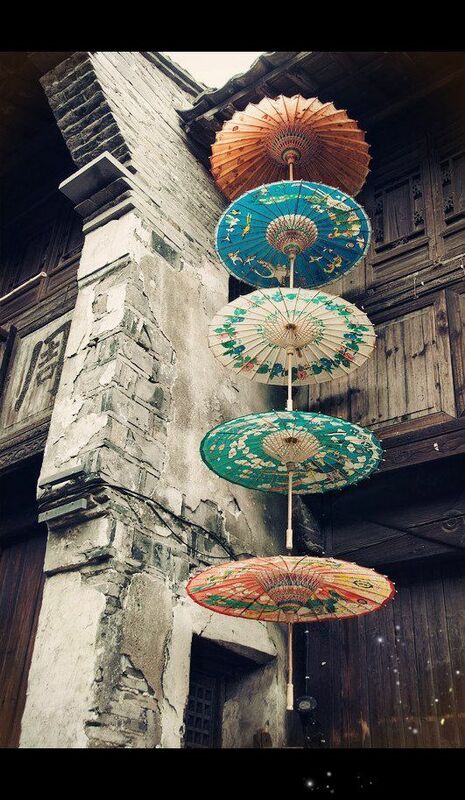 They both have characteristics of one-time work, which there is no turning back: once the wood is taken off by the hand tool, it is gone; once the calligraphy is written, ink is absorbed by rise paper, can not be altered. I do really like this idea, but the correlation on my theme is not very strong, so I am currently holding on it. Another advice from faculty outside of studio was about the spindles. She was concerning about all the spindles are too jail like; but I replied that I will add individual different angle on individual slats, because all the spindles cross section have oval shape, and their largest face will be directed toward the person sitting inside the chair, which forms the sense of safety and serenity, because his/her view is partially blocked by spindles. 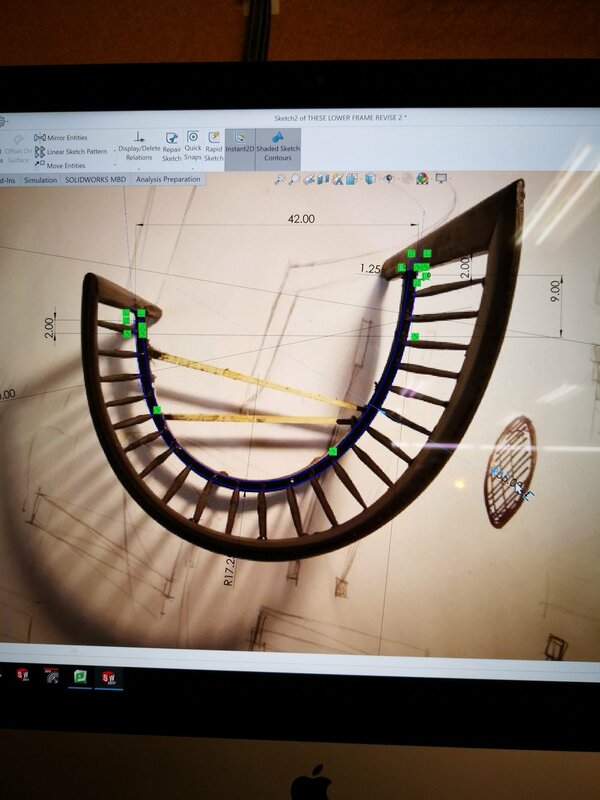 At the same time, people who walk around the chair could experience the positive and negative spaces changing from spindles, which create a visual dynamic movement. Currently, I am working on my chair design’s Solidworks modeling. I have figured out the method of fabrication and prepared for my solid wood mock up. Moreover, I modified spindle quantities and dimensions on the software, tried to find a balanced point, which not making spindle look too crowd and making sure spindles blocks the view. However, I did not make individual spindle oval shape which is too time consuming. I will test them out on my full scale mock up. Further, both back legs are still under development, I will also polish them once the mock up is completed.